Thank you Dandy® Brands & Duda for sponsoring today’s recipe. As always, all opinions are my own. Entertain this season with flavorful Mediterranean Stuffed Celery Sticks. 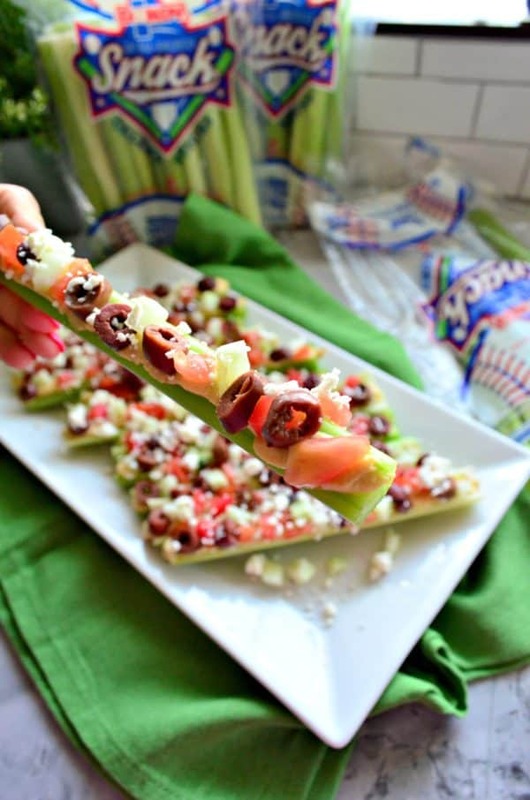 The perfect after-school snack or snack for the next sporting event to watch! Hello, snack season! 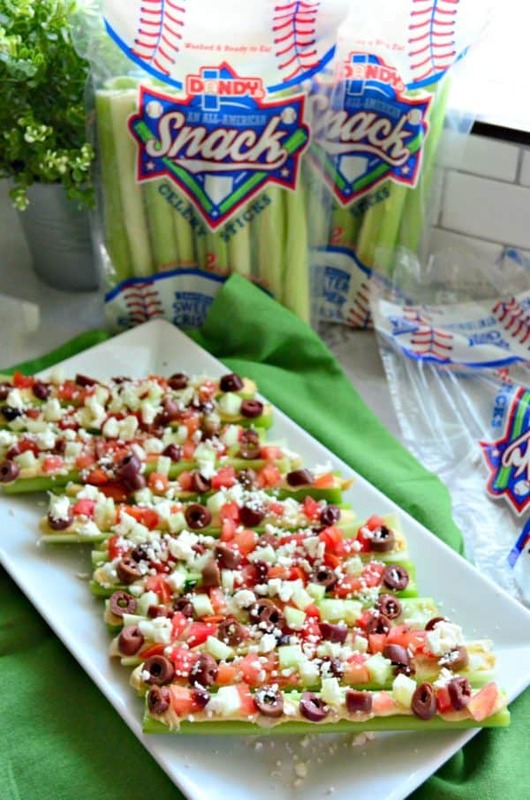 Whether you are watching baseball or football or making snacks for the kids after-school you might feel like you are on snack overload. Today, I’ve partnered with Dandy® Brands to share a healthy and easy snack that both children and adults will love. My kids and myself love to eat celery and I find myself always reaching for pre-cut celery for a quick snack. Most of the times, I’m stuffing celery with the classics like peanut butter or cream cheese. Most recently, I’ve started branching out and stuffing with soft cheese and hummus. This is how I created my recipe for Mediterranean Stuffed Celery Sticks. What I like best about this recipe is these stuffed celery sticks are gluten free and peanut free. They are cow’s milk – dairy free, but if you can’t do any dairy at all you can always omit the feta cheese. I love Dandy® Brands because they have been growing fresh fruits and vegetables for nearly 100 years – it’s a family business! Dandy® chooses not to use any genetically modified seeds to grow its products. This is something I’m very passionate about and try to feed my family as much non GMO products as possible. I didn’t realize this until recently, but the Dandy team works with PhDs on staff to ensure the celery is sweeter, crispier, and has less strings than any other celery brand. Who knew their was job like this in the world, and to me–it’s an important one. Another fact that I didn’t realize is that celery is 100% usable product, so that means less waste. Celery is all natural and free of preservatives, too. While celery is naturally low in calories, it is also packed with antioxidants and it’s a great way to get your favorite snack dips with great nutrition. Celery is an excellent source of Vitamin K and a VERY good source of folate, potassium, and dietary fiber. How do you make stuffed celery sticks? I like to place 1/4 cup of hummus in a ziplock bag. Then cut a tiny corner of the bag and pipe the hummus in the celery sticks. I also use this same method when stuffing celery sticks with soft cheeses like Boursin and whipped cream cheese. You can always use the traditional method too–slathering on the hummus with a knife or even a spoon. I find that the piping method is a little less messy. After all, we eat with our eyes first. How do you make Mediterranean Stuffed Celery Sticks? First you’ll want to grab a package of Dandy® pre-cut celery sticks. Then, pipe the hummus into the celery sticks. Next, chop your veggies–I like to chop the tomatoes and cucumbers very small making it easy to bite with little mess. I buy pre-cut kalamata olives and place a few on top. Lastly, sprinkle with feta cheese. You can prepare these a few hours ahead of time and bring them out when guest arrive to watch a sporting event. Or even once the kids come home from school. Just prepare, wrap with plastic wrap and store in the fridge until ready to serve. 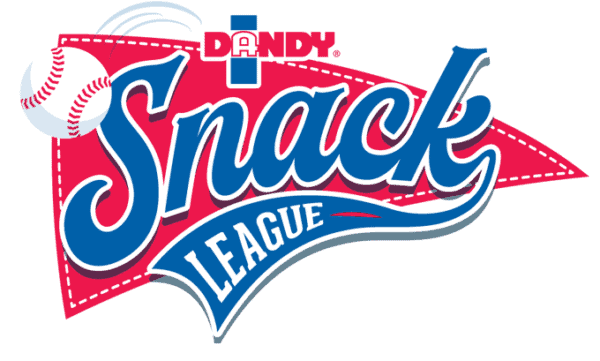 Enter the Dandy Snack League Sweepstakes! Make sure you enter Dandy’s sweepstakes for a chance to win baseball prizes. The sweepstakes is running from September 1st – October 28, 2018. 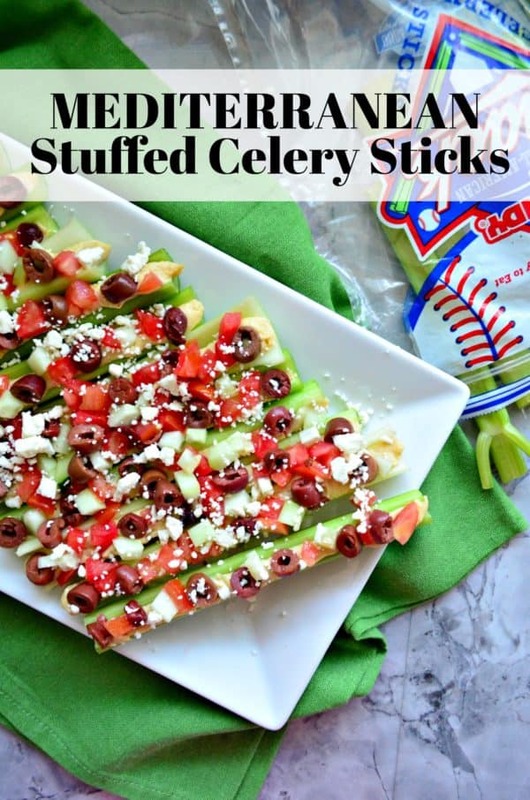 If your in a snack-time rut or maybe just looking to switch up the traditional stuffed celery. 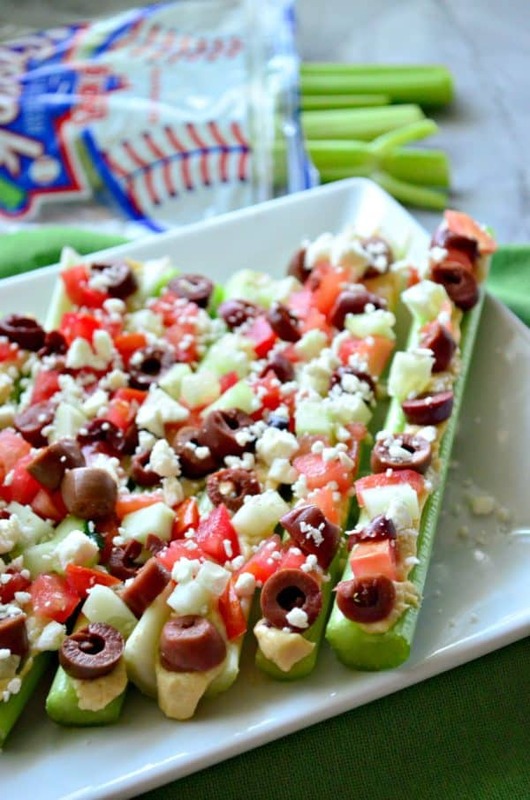 Try my easy and delicious recipe for Mediterranean Stuffed Celery Sticks. Place the Dandy Brand pre-cut celery stick son a platter. Scoop the hummus into a ziplock bag. Cut the corner of the baggy, and pipe hummus on to each celery stick. 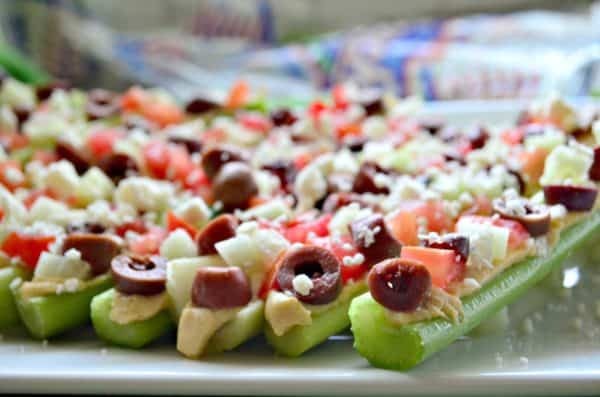 Sprinkle the diced tomatoes, cucumber and kalamata olives on top of each celery stick. Sprinkle the feta on top, enjoy immediately or refrigerate and serve when guest arrive.